As we found out previously in the History of the Console Version 3.0, the third prop was refurbished almost beyond recognition for Graham Williams' tenure, creating Version 3.1. In the seven years of service that followed, numerous changes were made to the controls and the layout of panels. When Producer John Nathan-Turner came along he decided that for his second year in charge, a new Doctor deserved a new console. Well, almost new. Around the start of spring 1981 the console was was needed for Peter Davison's first TARDIS scenes to be recorded for Four to Doomsday. The existing prop was brought from storage but it was extensively refurbished by the BBC Visual Effects Department in time for the studio session on April 13th 1981. Unfortunately, because the new Doctor's stories were recorded out of order, there are continuity issues as the design of the console changes and then reverts back from story to story. Most of the changes were brought about to tidy up the general look of the console, add a few bits of extra detail and reduce the number of colours which were present. However, this period in the show's history would see an almost unprecedented number of scenes set inside the ship, and various changes were needed on a monthly basis to serve the requirements of each story. Efforts were made to create a more consistent appearance and so the multi-coloured sticker strips which had adorned the edges of the panels were replaced by a thick, solid white border around each segment, although a few discreet strips were left to fill up blank areas. This had the effect of taking the prop back to a much more mechanical silver/grey appearance as it had been when it was first built for Pyramids of Mars. The raised rim which acted as a collar for the central column was repainted in plain silver and the red tram lines were lost. The housing on the printer was repainted from brown to light grey and its triangle of silver buttons was removed (pictured left). The row of flat switches beneath was replaced by a pad a of six green key-pad buttons, and red and green buttons were added beneath the green perspex cube. 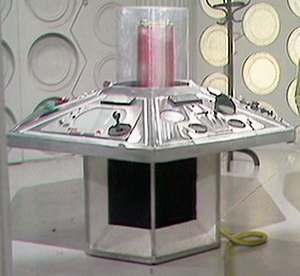 Simple changes such as this had a subtle but important effect on toning down the anarchic appearance of the console from the end of the Tom Baker era. A concerted effort was also made to standardise the use of a few controls by the actors. 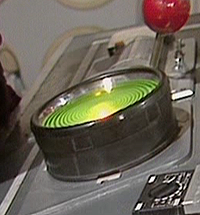 Whereas Logopolis had seen three different switches used to open the doors, from the start of the Fifth Doctor era, only the giant red toggle switch below the Chameleon Circuit was used - which at one time had been used to open the scanner. Not all the controls were consistent though, as during Four to Doomsday, the extending Chameleon Circuit keyboard was used again, only this time Adric used it to check some circuits which were displayed graphically on the scanner (via BBC Micro visuals). The additional diagonal covering was missing from the base of the console, revealing the mechanism which pushed the keyboard up (pictured right). On the Monitor Panel, sets of red and grey computer keys were added around the border (pictured left below Tegan's books). Next use of the console came for recording The Visitation on May 21st although the interior scenes were remounted in June. There was only one notable change made before recording began, and that was the mysterious application of large strips of black electrical tape to cover the horizontal panel of lights below the printer (picture on the right). We discover that the far-right light on the Chameleon Circuit's cover panel blinks to report a fault on the Lateral Balance Cones and Peter Davison also breaks off one of the switches on Panel 2. Kinda was made at the end of July using no TARDIS set, after which the Fifth Doctor finally recorded his debut Castrovalva in mid September 1981 and this brought about the afforementioned continuity problems. For the purposes of the new Doctor's introductory story, the TARDIS Index File was viewed by Tegan and Nyssa and so - for the first time ever - the Monitor Screen panel had to actually work. The fake screen was removed and in its a place a small computer monitor was mounted accompanied, for some inconceivable reason, by a keypad with just the letters A-I. To the left a green LCD display was mounted and other buttons were added surrounding it. The large black toggle switch and speaker grille were retained. 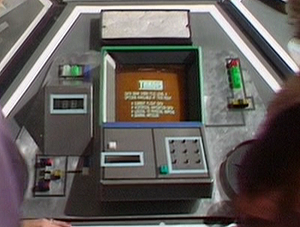 Because of the inconsistent broadcast order, this new computer panel appears in Peter Davison's first televised story, vanishes for the next three adventures which were recorded first, and then reappears at the start of Black Orchid - albeit slightly modified again. The ungainly and inadequate keyboard had been removed along with the entire LCD housing and the green border around the screen (pictured right). For the recording of Earthshock, the console prop underwent another minor reburbishment, with various items added and adjusted ready for recording the TARDIS scenes on 10th November 1981 including equipment underneath for use when defusing a bomb (pictured left). Also for this story, the black electrical tape was removed beneath the printer so the wide horizontal grille appears white again. The beneath the Chameleon Circuit ther were various modificaitons. Most notably a large, lime-green light was mounted to the right of the door lever in place of the circular perspex tray which had once housed the Mk 3 Emergency Transceiver. It throbs to alert Nyssa to the fact there's a strong electromagnetic field nearby. To the left of the red door control, the components had been altered slightly. Finally, an unintentional change can also be noted as the remaining Glare Sheild has been lost. 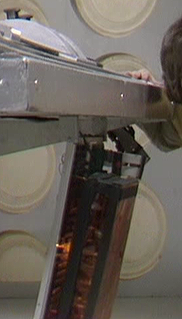 When the console prop was brought from storage for studio material on Time Flight on 1st February 1982 it had been assembled completely differently to its appearance in Earthshock. Panel 3 was nearest the door with the Chameleon Circuit. Then anti-clockwise next was Panel 6, Panel 5, then Panel 1 with the Printer, then Panel 2, and finally the Monitor Screen Panel 4 furthest from the camera. No notable changes were made to the controls themselves. 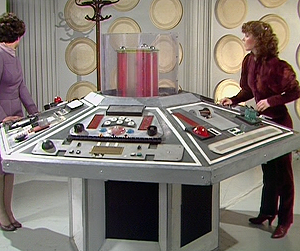 For Doctor Who's Twentieth anniversary season, the TARDIS console was given a major refurbishment ready for recording to begin on Snakedance on 28th April 1982. The surface of the console was completely repainted in metallic silver finish, and the white borders which had framed all the panels were removed. 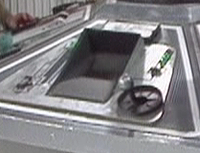 The panels were in a different order to their previous arrangement but in fact were returned to their layout from before Time Flight, as it had been throughout Season 19. Significant additions and changes were made to each of them. The previous refurbishment for Season 19 had made the design more business-like, taking it back to its roots, but ironically, the revamp for Season 20 once again took it in the opposite direction, becoming more colourful as it had been at the end of the Tom Baker era - particularly introducing a lot of brass/gold/orange colours which added a slightly Victorian hint. At the top of all the panels the old speaker griller had been replaced by a raised silver viewing slot which glowed purple some of the time from within. Panel 1 no longer looked anything like a face and new components had been added around the printer. A raised, golden square was added along with a five-sided pyramid which flashed when the TARDIS recall circuit was activated (pictured right). The "mouth" of the face has its top cover removed and the lights brightened up. Next along, on the Panel 4, the monitor screen was inclined further back so it lay flatter on the surface and a new frame was added with a broken back line around the edge. Beneath the screen a new set of buttons was mounted and to the left was a new interface with a large cartridge slot. The black joystick-toggle to the right of the screen was now encased in a gold hemisphere. Panel 2 was given new filters inside the circular windows. Another gold square was added beneath the purple viewing slot and the black rings at the bottom which had always been empty in previous designs were now brightened with red and orange circuit patterns inside. The last Panel 5 had the fewest changes. The dome beneath the "eyeballs" was painted silver and the black dials were removed from the top panel and a replacement was put in the bottom right after a red knob had been lost. 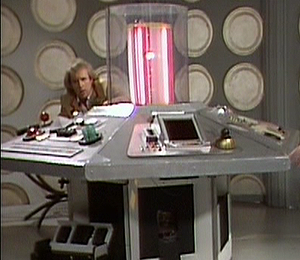 This revamped console remained the same when it returned on 17th May 1982 for the extensive material in The Arc of Infinity and four months later it was used again for Mawdryn Undead on 8th September. The following month, a small addition was made to the console for the story Terminus. Next to the lime-green cylindrical light, a hatch was built in, beneath which was a small fuse-like device which the Doctor pulled out as a safety cut-out to help with the "rotor jamming" (as by this stage the term "Time Rotor" had incorrectly been applied to the central column and began to gain popular use). During the recording of the final story of the season, visual effects designer Mike Kelt apparently complained about the condition of the prop which was a little under eight years old. As a consequence, the studio session for Enlightenment on 17th January 1983 would be the final time the console was regularly used (pictured left) as it was decided that a new console could feature as part of the anniversary special. A year and a half later, the prop was brought from storage for a very special appearance. 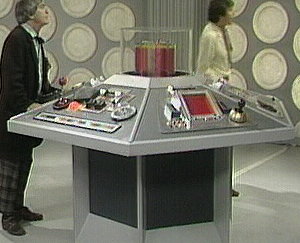 When plans were made to bring back the Second Doctor played by Patrick Troughton, he was to need his own "retro" TARDIS. And so the old console was refurbished once again for its studio appearance on August 31st 1984 at a time when the Console v4.0 was in use. A degree of work had been done for this one-off appearance. The whole prop was given a repaint, with darker panels and light grey top, edge and spokes. 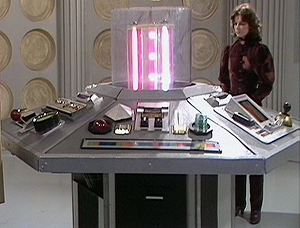 The five-sided pyramid which had been donated to the new Console v4.0 was replaced with a flatter version and on the same panel an orange perspect component was added along with a new Dematerialisation lever and a large, clear dome acting as a "Teleport Control" was installed by the Time Lords, which replaced the green perspex cube. Other minor changes included a blue covering for the black drum and a change to red illumination inside the viewing slot. The two panels nearest the door had been swapped over but otherwise it retained the same configuration as its final proper appearance. This was the very final use of the long-serving prop as for the previous 19 months a brand new console prop had been in use.